Home > Industries > Metals > Industrial Parts Pressure Washers > Multi Tank Ultrasonic Cleaners With Gantry > Three Tank System; Clean Rinse Dry With 50 lbs Load Capacity - Load and Unload Conveyor. 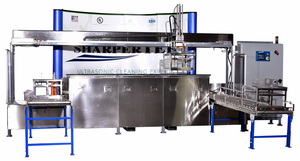 With a clean, rinse, and dry tank this automated cleaning machine ensures high throughput and precision cleaning. 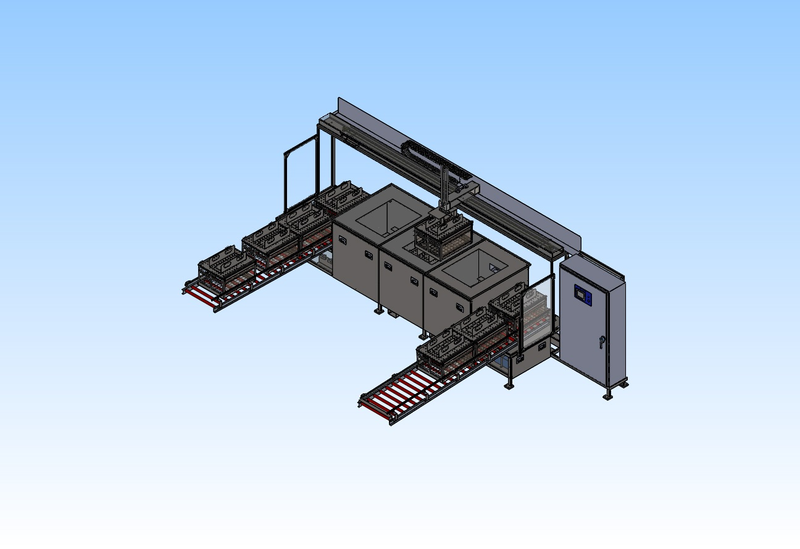 Gravity feed conveyors and custom part holding baskets allow an operator to load parts and then do other work as this machine loads, unloads and cleans, rinses, and dries up to 11 baskets at one time. For use in any environment with its all stainless steel construction this cleaning machine can be an ideal fit for you. 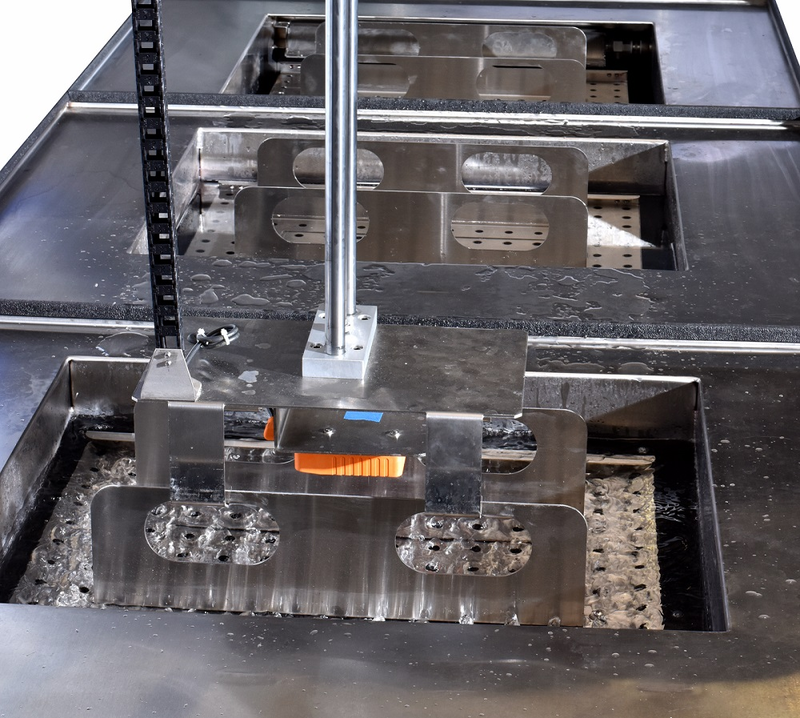 Coming in under 6 figures ensures that high throughput and precision cleaning is affordable to businesses looking to cut down on labor for cleaning parts. Please contact Sharpertek if you are interested in purchasing this exact machine or something similar; we design, fabricate, assemble, and program our machines in Pontiac Michigan so any customization desired can be considered! o Tank Size: 20�x26�x14� (LxWxH). o Tank Material: 12 GG SSTL 304. Tank Welds: Welded on outside of tank. Weld Type: Mig and Tig welded and dye penetrant checked to insure water tightness. Water tightness then verified over a period of 2 weeks. Internal welds are pacified per ASTM 967. Outside of tank insulated with ceramic insulation. 40kHz ultrasonic frequency for cleaning of fine toner particles. All inlets and outlet fittings are Tig welded on inside and outside of tank. Temperature sensing is done with internally welded tubing with thermocouples wired to PLC and HMI controls. Thermocouple has dielectric grease for better temperature readings. Autofill system- .75� NPT connection to water source with solenoid and liquid level protection � protects ultrasonics and heat against running dry. Maintains optimal fluid level in tank. Requires connection to customer drain. Heater System: Designed to maintain cleaning fluid temperature. Includes an immersion heater with digital temperature controller. Optional: 40kHz ultrasonic frequency for cleaning of fine toner particles. o Tank size & material are the same as cleaning tank 1.
o Tank Welds: Welded on outside of tank. o Weld Type: Mig and Tig welded and dye penetrant checked to insure water tightness. Water tightness then verified over a period of 2 weeks. o Internal welds are pacified per ASTM 967.
o Outside of tank insulated with ceramic insulation. o All inlets and outlet fittings are Tig welded. o Temperature sensing is done with internally welded tubing with thermocouples wired to PLC and HMI controls. o Includes a recirculated hot air dryer system, which includes a 3KW heater core, and 300 CFM blower. o Compressed air air-knife, adjustable opening to control flow/pressure. o Temperature is controlled with included digital temperature controller, insulated with �� Ceramic Insulation, and has a maximum temperature of 200 degrees F.